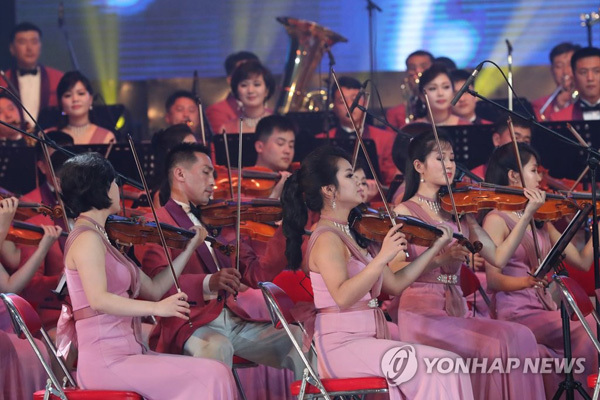 North Korea’s Samjiyon Orchestra held a concert at the Gangneung Arts Center in South Korea’s Gangwon Province on February 8 this year, one day before the opening of the PyeongChang Winter Olympics, in a goodwill gesture to wish for South Korea’s successful hosting of the Winter Games. As the first North Korean performance in the South since 2002, the show paved the way for facilitating art exchanges between the South and the North and turning the PyeongChang Games into an Olympics of peace. 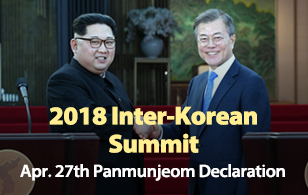 And the positive momentum led to the inter-Korean summit in late April. But it wasn’t the first time for the two Koreas to create a reconciliatory mood through art ahead of their bilateral summit. Today, we’ll review the Pyongyang Circus Troupe’s performance in Seoul in 2000. On June 4, 2000, the Pyongyang Circus Troupe received enthusiastic cheers and applause from audience members who packed the Jamsil Gymnasium in southern Seoul. The show was arranged to create the venue of harmony between South and North Korea in the run-up to the historic first inter-Korean summit since national division. But it took a long time before this special show actually took place. It was 1989 when I first floated the idea of staging the North Korean acrobats’ show in Seoul. At the time, the circus troupe performed in The Hague for about a month. My friend who worked for the Korea Trade-Investment Promotion Agency’s Hague branch watched the show and suggested to me that I arrange the troupe’s show in Seoul, as its phenomenal art performance would be a big hit and also contribute to promoting inter-Korean relations. So, the Hankyoreh Foundation for Reunification and Culture, along with the Hankyoreh Newspaper, began to make contact with the North Korean Embassy in Beijing. It was not until the end of May in 2000 that the Pyongyang Circus Troupe came to Seoul ahead of the first inter-Korean summit in June. It was sort of a commemorative event to celebrate the historic event, like the North Korean Samjiyon Orchestra’s performance in South Korea on the occasion of this year’s PyeongChang Olympics. You just heard executive director of the Hankyoreh Foundation for Reunification and Culture Lee Byung, who also served as the executive secretary of a promotion committee for the Pyongyang Circus Troupe’s Seoul performance in 2000. As Mr. Lee explained, the foundation planned the show from the 1990s. In North Korea, acrobats are chosen among talented students from around the country based on strict standards for physical conditions, appearances, athletic ability, courage and boldness. The selected acrobats go through rigorous training to sharpen their skills further. In the North, the nation’s world-class circus is not a simple acrobatic show or entertainment but is regarded as a genre of body art. North Korea often uses it as a means of promoting culture and diplomacy, with its circus show briefly introduced at an inter-Korean basketball game at Jamsil Gymnasium in Seoul in 1999. Several groups, including the Hankyoreh Foundation for Reunification and Culture, planned the Pyongyang Circus Troupe’s Seoul show, which became a reality ahead of the first inter-Korean summit in 2000. But Mr. Lee says that it wasn’t easy to prepare for the stage, either. It turned out South and North Korea used different terms. We and the North Korean circus troupe didn’t hold any preliminary talks, and it took some time for both sides to understand each other’s terms. When we said we use 64 audio channels, for example, the North Koreans didn’t know what it meant. There certainly was a cultural gap between the two sides as a result of a long separation and different systems. It was challenging for both the South and the North to overcome the language barrier and narrow the differences in terms and culture. Also, it was difficult to install structures on the stage. The structures should be erected perfectly for the safety of the performers who would display acrobatic skills with a high level of difficulty. But there wasn’t enough time for the 100 troupe members, who arrived in South Korea on May 29, to prepare for their show scheduled for June 3. Fortunately, the South and the North managed to carry out preliminary inspections and rehearsals to resolve the problems one by one. They also decided to hold the event starting June 4, a day after the initially planned June 3. The circus troupe from the North fully cooperated with the South Korean promotion committee and prepared for the event well even during the short period to be able to best-showcase its abilities. Mr. Lee recalls the moment. There were a total of 11 performances, and I never missed a single event. Every time, I was stunned to see their incredible show and exclaimed. I was simply amazed at how human beings could perform like that. In one astounding event, a rolling cylinder was laid upon another and another, and a male performer did some acrobatics on top of the layers of the rolling cylinders. The jaw-dropping performance was really thrilling, and some spectators were even worried if the acrobat might fall. At 7:30 p.m. on June 4, the show started with a dazzling aerial stunt, with a performer jumping from the height of 18 meters. As Mr. Lee said, the show was filled with wonder and amazement. The 90-minute fantastic show featuring a quadruple somersault, cylinder rolling, pole circus and many other spectacular feats captivated 12-thousand spectators. The final part of the show was particularly impressive. Let’s hear again from Mr. Lee. At the end of the show, 12-thousand audience members all stood up, clapping and singing the song “Our Unification” together. They were sharing the emotional moment with each other, hand-in-hand. It was a very rare, dramatic experience to bring the two Koreas together, adding to the festive atmosphere of the first North Korean acrobatic show in South Korea. Personally, I hoped to contribute to better inter-Korean relations and the unification of Korea. I think I was very lucky to be part of the event in 2000. It was an irreplaceable gift and honor given by God. The event deeply touched the hearts of many people, who couldn’t conceal their surprise and excitement at the wonderful show. When the performance was over, the audience showered the North Korean acrobats with applause. The troupe members held 11 performances from June 4 to 10, when the two Koreas became one on stage. After the commemorative performance ahead of the inter-Korean summit, many South Korean citizens began to show their interest in North Korean culture. There were screenings of North Korean movies that had been stored at the North Korean data center of the Unification Ministry, while more North Korea-related books were published. The inter-Korean reconciliatory mood lasted until the three-day inter-Korean summit that started on June 13, 2000. Mr. Lee continues. There’s nothing like a cultural show to melt the hearts of people in South and North Korea. That’s why local news media showed the emotional scenes of the North Korean circus troupe’s performances and brought to light public desire and expectations for the inter-Korean summit back in 2000. I think the event served as warm air spreading through the frozen cross-border relations. If the Pyongyang Circus Troupe performs in Seoul once again, I hope I can do something for the event, whatever it is.